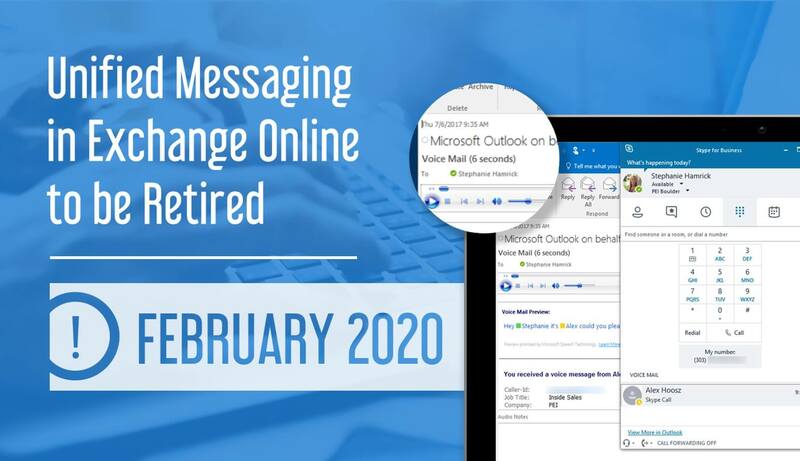 Microsoft has announced that Unified Messaging in Exchange Online will be retired by February 2020 and replaced by Cloud Voicemail and Cloud Auto Attendant services. This change affects the processing of messages; voicemail storage will be still be available and supported in Exchange Online. Microsoft customers using Skype for Business Server or Lync Server in combination with Exchange Online Unified Messaging will be impacted. Skype for Business Online and Teams already run on Cloud Voicemail and Cloud Auto Attendant services and will be unaffected. On-premises Exchange Servers will also be unaffected. Customers with Lync Server 2013 or Skype for Business Server 2015 will be transitioned to Cloud Voicemail by Microsoft. Customers will be notified individually when Microsoft has selected them for transition through the Office 365 Message Center. Those wishing to postpone their scheduled transition can submit a request using the support tool in the Office 365 Admin Portal. Lync 2010 Servers connected to Exchange Online Unified Messaging will not be supported with Cloud Voicemail. These customers will be required to upgrade to Skype for Business Server before February 2020 to receive continued voicemail support through Cloud Voicemail. The transition to Cloud Voicemail will affect three Unified Messaging Services: voicemail, auto attendant, and fax integration. Microsoft expects Cloud Voicemail transitions to happen seamlessly with only a small number of engagements requiring involvement or investment from customers. These migrations will be Microsoft-driven. Auto attendant customers will need to rebuild existing Unified Messaging auto attendants in Cloud Auto Attendant before 2020 and switch their phone numbers over to them. The auto attendant migrations will be customer-driven. Fax integration will not be supported by the new cloud-based services and customers will need to find and migrate to a third-party solution. See the most up-to-date version of this chart here. Cloud Voicemail has been at work processing millions of calls each month for Skype for Business and Teams users since 2016. By moving these services to the cloud, Microsoft will be able to integrate modern platform services such as Cortana, Graph, and AI. With more users on the Cloud Voicemail platform, Microsoft will be able to devote more resources and provide an enhanced user experience. No email is sent to users notifying them about voicemail account activation/migration. Users will have access to their previous voicemail messages in all supported endpoints. Users will continue to receive their voicemail messages in all supported endpoints. CVM transcription has a much higher accuracy rate and supported languages than ExchUMO. Users will be able to change their preferences from a User Setting Portal (USP). Users can access their USP from a hyperlink in their voicemail email, or the User-Settings button on their SFB client; https://aka.ms/vmsettings. Features Please see the feature-set comparison for details. Previously created rules will apply to CVM messages after migration. Need Help with the Transition? If you believe your environment falls under the category of requiring admin involvement and want to get your systems ready for this change or if you’re on Lync Server 2010 and want to learn more about upgrading to Skype for Business Server, our senior-level engineering team can help. Contact us now to learn more by web here or by phone at 303-786-7474. Subscribe to our blog below to make sure you never miss another update like this!